Remain Calm, Buy Duct Tape: America, meet your "terrorists". I'm in the midst of writing a much longer and more involved post for later today or tomorrow, but I saw this story come off the wire and just had to say something about it. I don't know how many dozens of times I've heard a Bush apologist say something along the lines of "Everyone in Gitmo is a terrorist, and they deserve to be there, besides, it's not that bad at all. They get lemon chicken..."
I think we can go past the "It's not that bad" excuse, not only because of the torture and the hunger strikes and the bloody and painful forced feedings but simply because it's a jail. 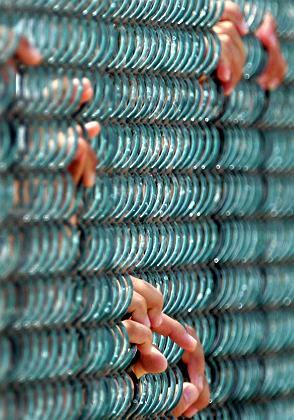 People are housed there in cages, kept away from their homes and families, with no personal freedom. It's nearly the worst thing the system can come up with to do with domestic criminals, so it's probably pretty high up there on the list of nasty things that can be done to terrorists. Now, with the release of new documents and names, we can begin pulling apart the other rationale. I've long contended that it's only natural that the military would be a little overzealous in deciding who is and who isn't a terrorist in a war zone filled with potentials, I don't blame them for that. What I do take issue with is that the American government simply rounds these people up and puts them away somewhere convenient, never informing them of their charge, and simply forgets about them. I'm obviously not saying that no one being detained right now is affiliated with Al Quaida, but I believe that a great many, perhaps the majority of prisoners held are not "enemy combatants" and are likely no threat at all. Excepting, of course, the threat created when a friend or family member of one of these detainees decides that America is the devil for taking this farmer or that student away under suspicion of being involved with "them". "I never had a weapon. I never carried a weapon with me and I've never been in any kind of armed fight,"
The evidence against others can seem flimsy. In at least one case, it appears to include only the fact that the suspect wore a Casio watch _ a brand allegedly favored by terrorists for use as bomb timers. Shah, a farmer who said he had never left his village before being arrested because he wore an olive drab jacket. "I was just walking in the street and I was captured," Shah said. "The next thing I found out is that I am sitting here." Are these the kinds of terrorists that you picture in your mind's eye when Bush stands behind that podium and promises to keep this war going for as long as he sees fit, an apple seller and a farmer? I was having trouble thinking of a way to end this, but I'll go back to that apple vendor, whose fate is (as the article notes) completely unknown as he was not named in the transcript, I think he's got a good handle on it. "I always knew America as a democratic country and always heard positive things about America," he told the tribunal. "I believe that after 9/11 America became very aggressive and that's probably the only reason I'm here." Update: More from the post on this Here. The government of the US, my Govt. is filled with war criminals, and it is not even close. America became paranoid since 9/11 and the trauma of the catastrophe seems permanent. It's possible but I don't think this is permanent. I think that a decade or more from now Americans will look back at this time with the same kind of shame and regret that goes with the internment of the Japanese Americans during World War 2. That kind of paranoia took place in Canada as well, and was easily one of the darkest periods in our history. The grand irony is that if they set out to create terrorists, they couldn't have done it much more effectively. I sincerely hope the future generations won't be paying the price for what happens today.